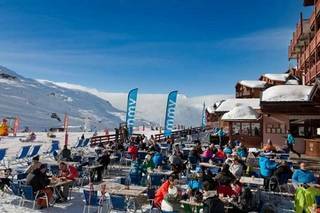 Ski hotels in Tignes : compare ! During your stay in a cheap ski hotel in Tignes, you will find a mountain resort between 1550 and 2100 meters long, providing you with a multitude of sports facilities. For your ski hotel reservation in Tignes, discover where to go at the best price from stays available from several dedicated sites. You will have the choice between several hotels of different categories, if you are family, you can privilege a hotel of ski in Tignes in a family room or a suite. Also, stays in hotel clubs are perfect with children, as animations are offered on site during the school holidays. From your hotel to skiing in Tignes, experience the daily life of a lively resort where all winter sports are at the rendezvous: ice climbing, ice circuit, helicopter, heli-skiing, paragliding, ice diving, hiking in snowshoes or dog sleds. Your hotel in Tignes will allow you to take advantage of the 300 km of slopes of Espace Killy. In addition to all these activities, a nursery for children from 4 years old and a ski school in Tignes will make your week with your family easier. You will be able to use our search engine to find offers that offer the services you want and compare prices to find the cheapest hotel for your ski holiday in Tignes.